The Takeout commentariat points out the frequency of questions about tipping sent to our own Salty Waitress. Not too long ago, she answered a question about whether to tip on the pre- or post-tax total: “Do you know how often I get asked this question? Like once a week. So why haven’t I answered it in this column yet? Because it’s a dumb, cheapskate question.” As Salty points out, the difference is usually minor, so be the bigger person and round up to the larger amount while tipping. A CNBC video released in February 2018 took on viral status on Twitter over the weekend exploring the same issue, but via a different route. CNBC reporter Zack Guzman (now with Yahoo! 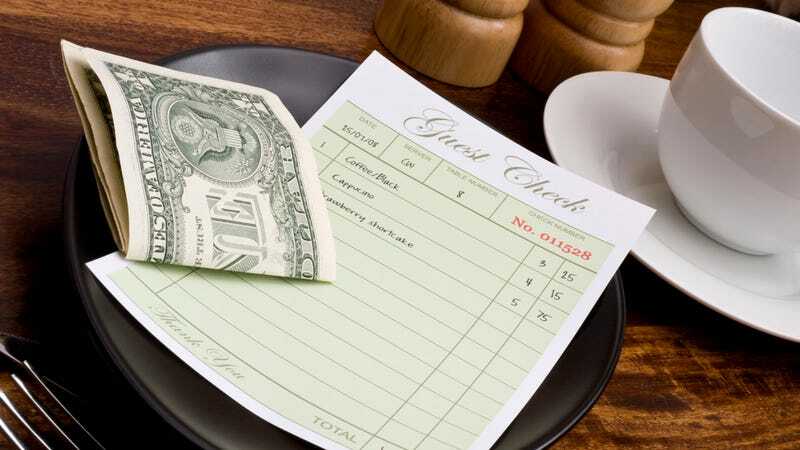 Finance) calls tipping a “seemingly insignificant decision that can add up over time,” which “could save you over $400 without looking cheap.” Bit of a swing and a miss, there. Guzman’s suggestion is to tip by doubling the tax (which results in a tip that’s about 18%) instead of going to 20%. A few people CNBC talked to on the street support him in this, saying they tip around 10%, and even etiquette expert Lizzie Post backs him up, saying that 15-20% is just fine. But the video contains a serious dose of tone-deafness, in that you would be saving money at the direct expense of another person. So Guzman’s general thesis that you can save money by giving less money to the people serving you has kicked off a bit of a hellstorm on Twitter, as well as yet another debate on the unfair tipping culture, which our long-suffering Salty Waitress is well-familiar with. In Guzman and CNBC’s defense, he’s not suggesting not tipping at all, and his double-tax method probably adds up to more than 15%. But still. As the Twitter protesters recognize, shaving a few bucks off of the money you’re giving to the hard-working people who are serving you is a lousy way to add to your bankroll. How about making a few meals at home instead if you want to save $400 a year? We have lots of suggestions. Ask The Salty Waitress: What do I charge when a customer does the tip math wrong? Should man who drunk-tipped $22,000 have to pay up? Ask The Salty Waitress: How can I make sure my server gets my tip?